Two watches became tightly associated with the Soviet space program in the 1960's. The first one, the Shturmanskie (Navigator), is famous because it was worn by the first cosmonaut, Yuri Gagarin. He became the first man to travel into space, launching to orbit aboard the Vostok-1 in 1961. The watch was not designed specifically for space flights. It was simply the model that was issued to graduated fighter pilots. Gagarin got his wings in 1957, in a MIG-15. 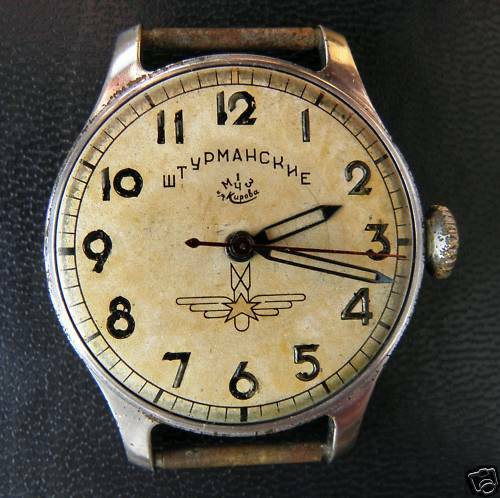 This particular Shturmanskie was made by the First Moscow Watch Factory in 1950. The movement was produced on equipment designed for the LIP R-25, bought from LIP in France and was produced between 1949 to 1954. It has radium dial and hands. Unfortunately, the radium accelerates the aging of the dial. The model is sought after among collectors, so there are many fakes around. This one is however authentic apart from the seconds hand, which is slightly too short. I plan to have it replaced one day. The movement has 15 jewels and is exceptionally accurate. The next model is the Strela (Arrow), this time a chronograph. It was initially only available for military, space, scientific and official use. It became the first watch in the actual space when Alexey Leonov made the first ever spacewalk, when he was outside his spacecraft for 12 minutes and nine seconds on March 18, 1965. He wore a Strela strapped to the outside of his space suite. The Strela was issued to cosmonauts for 20 years before being retired in 1979. 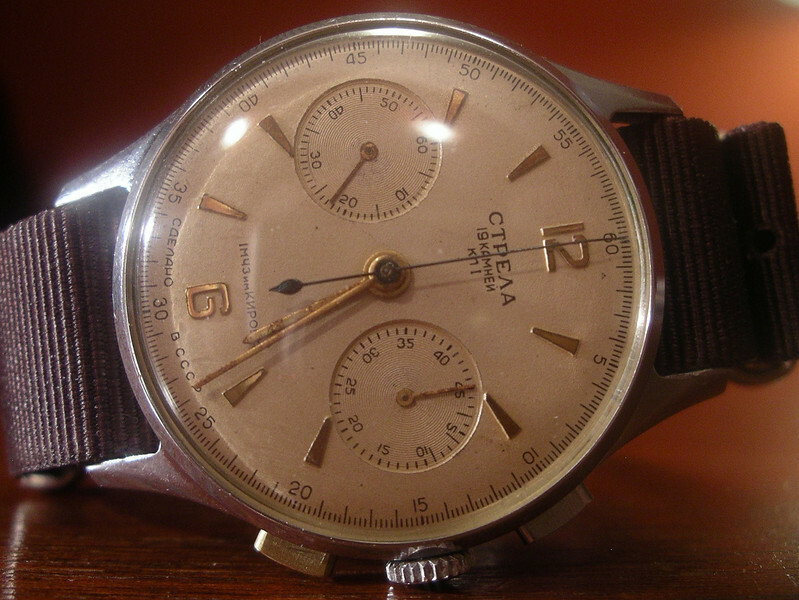 This particular watch was made in about 1962, also by the First Moscow Watch Factory. It is equipped with the 3017-caliber, 19-jewel column-wheel chronograph movement based on the Venus 150. There were many variations of the dial over the years. Following the success of the space program in the mid 1960's, the watch became available to the public, and later even special export models were created. The label "КЛ1" means First Class. Those watches underwent more rigorous testing and regulation. 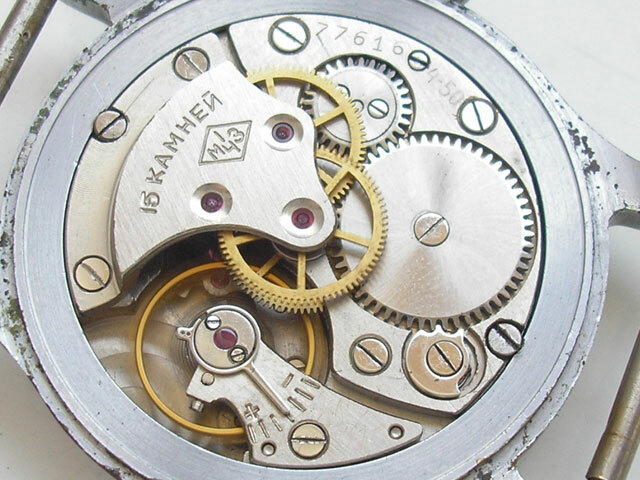 Column wheel chronograph movement with 19 jewels. You have quite a collection of Russki watches Lars. Very impressive. The case on that Strela is spotless. Zaf had a similar Czech Air Force issue example recently, was tempted to grab it but the case was a little rough. What can I say, Lars? Another stunning post. 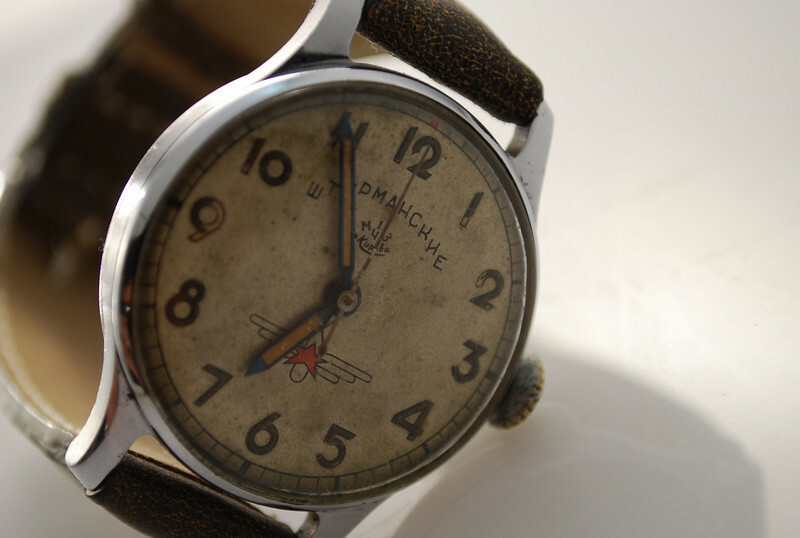 Simon also has a Shturmanskie http://forum.atgvintagewatches.com/s...ead.php?t=1903. Presumably "4.50" engraved on the movement is how you dated it and means it was made in the last quarter of 1950? I have posted about my Czech AF issued 3017 cal Poljot here http://forum.atgvintagewatches.com/s...ead.php?t=1342. Last month I acquired two more Czech issued 3017 cal watches, an early Strela and a late, white luminous dial, paddle hand Poljot, which like yours were also worn by cosmonauts. I'm planning a comprehensive post when I have taken some decent photos. It's quite interesting to see all three watches side by side as you can see how they changed over the years. A military service life of nearly 30 years is good going. I think that these 3017s are probably my favourite Russian military watches. 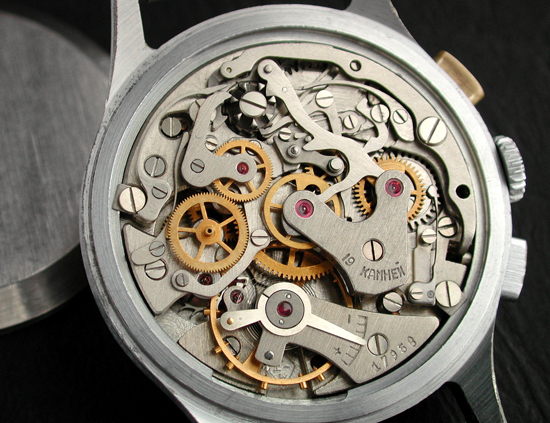 Presumably "4.50" engraved on the movement is how you dated it and means it was made in the last quarter of 1950? Thank you. Yes, 4.50 means exactly that; fourth quarter of 1950. The Strelas lack time stamps, so one has to judge by the serial number. That is why I wrote "about" 1962. Very nice watches. I am still missing the first Shturmanskie in my collection. I just bought a Pobeda with the same hands for the 15 jewel Shturmanskie version, in case I found a Shturmanskie with the wrong hands. I highly recommend you get one! They are fine watches; the movement is remarkable good, and you can't beat the historical aspects. Actually, I have one more Shturmanskie; a 1951 model. It has lost the lume on the hands, otherwise it is in quite nice condition. This one has the correct seconds hand, as opposed to the watch in my original post. Last edited by Lucidor; 22-02-2010 at 21:05.